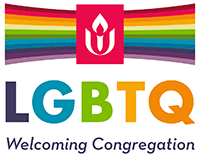 We are a member congregation of the Unitarian Universalist Association, a faith of open minds, caring hearts and helping hands, with a long history. Truths evolve as we do and may be discovered everywhere. Drawing on the discoveries of science and all the world’s faith traditions as sources of insight and understanding, faith be-comes an adventure. We don’t claim to know ultimate truths, nor believe this essential to living true lives. We have no creed. Unitarian Universalism is an ethical approach to faith. Here one can be Buddhist or Christian or Jewish or humanist or pagan or agnostic or atheist and be UU, too. For us, faith is inherently personal and interwoven with our life journeys. Our members are diverse. We gather to learn from and grow with and care for each other, to deepen our lives and to help heal our world. Diversity opens us to expanding awareness and unfolding possibility. Our rainbow ribbons and sign signal our welcome to LGBTQ people, and our commitment to create a safe home for the human spirit. We are small as churches go, but those who discover us often feel they have long been Unitarian Universalist without knowing it. We “UUs” demystify religious terms, tracing them back to their root meanings. Religion derived from religare, re-tying, rebinding us―to Life and to human community. Worship derives from Old English: weorth & scipe ─ the shaping of worth ─ and worthiness and meaning. To minister is to serve. Ministry is our mutual calling to lead lives of service and integrity. Ministry invites each of us to find a role in creating a beloved community here and in the world. UUGP is member-led—our members help plan and lead programs and events, care for each other, pursue social justice and environmental ethics in our community and beyond, and are fully engaged in congregational life.